As anyone who's ever tried to get some serious writing done in the same room as their cat knows, felines are skilled at finding ways of redirecting attention back to them. Nowadays, that often involves kitties clamoring over our keyboards, or basking in the warmth atop our laptops -- but, as it turns out, cats it medieval times also knew how to get in their owner's way. 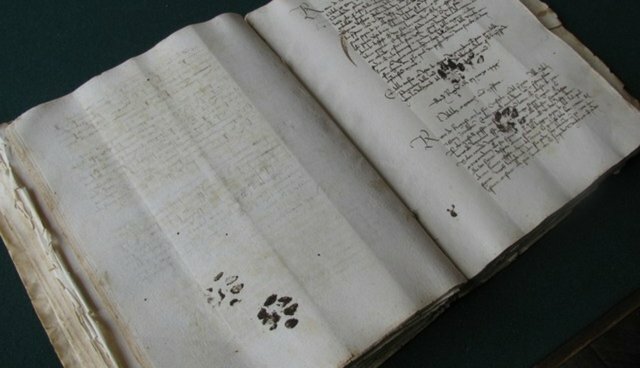 Doctoral student Emir O. Filipović was perusing through some centuries-old texts last year when he happened upon a manuscript whose pages bear the indelible mark of one ancient cat's unsubtle protest.